As you may have noticed, we are very passionate about supporting the work of artists and makers, whether it’s through attending community art fairs showcasing local artisans or purchasing handmade items online from a maker in another city. Etsy is one of the best places to search for one-of-a-kind pieces made with love by talented artists and designers. 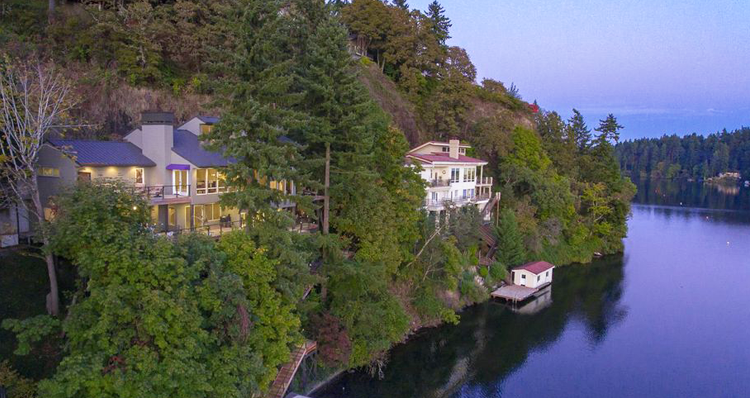 We also have a lot of pride for our home state of Oregon! 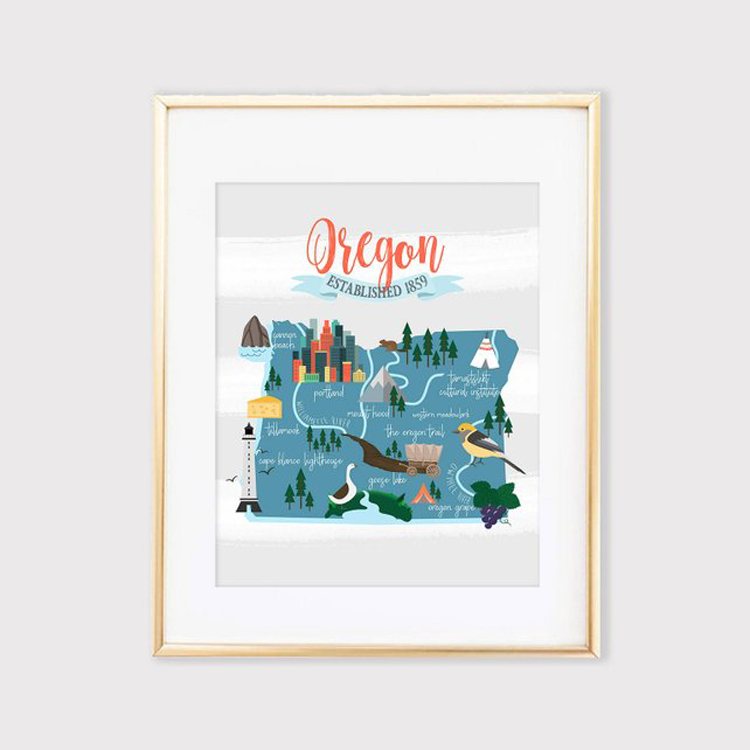 Bring the two together by purchasing an Oregon-inspired piece of wall art on Etsy to showcase your state pride. These pieces would make for an excellent housewarming or holiday gift, college dorm decor, or an addition to your own home. 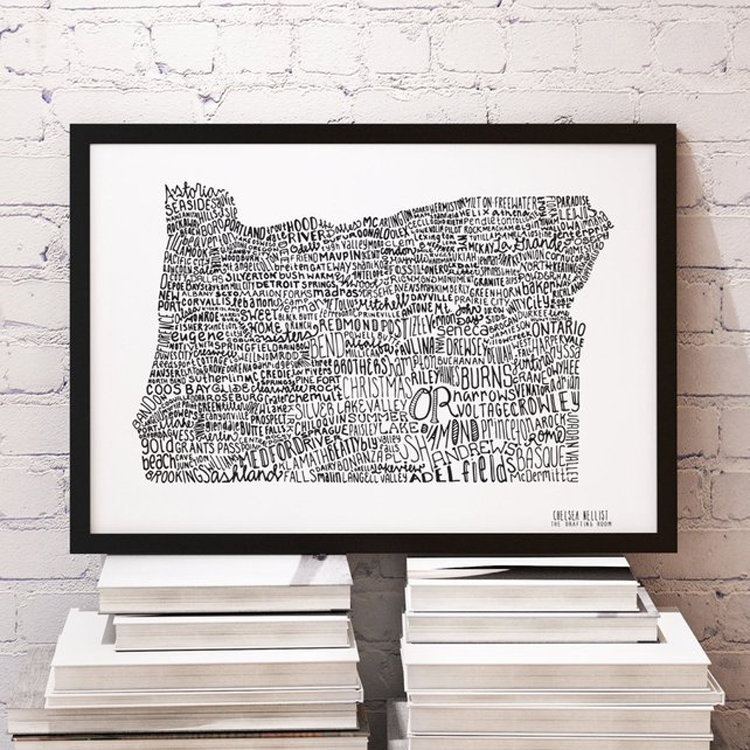 Chelsea of The Drafting Room has created this intricate typography map of nearly all major cities in Oregon, drawn by hand in archival pigma ink without the use of computer generation. Order a print of the original artwork in a variety of sizes — from 8.5-by-11 to 13-by-19 inches. 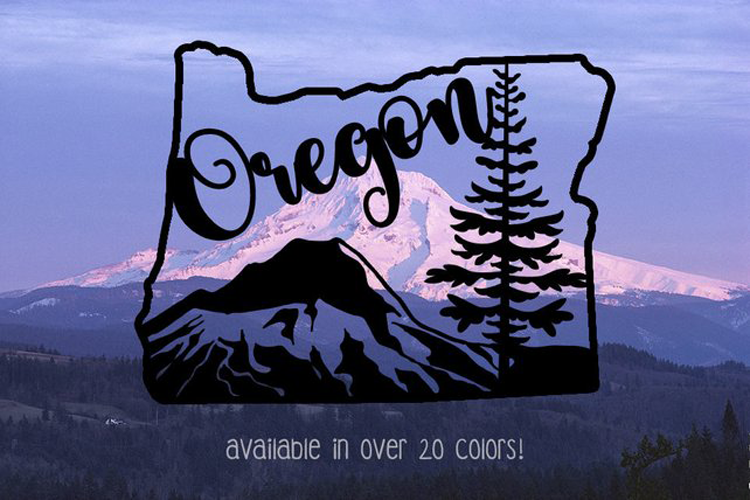 This Oregon vinyl decal has a beautiful yet simple PNW scene of a pine tree and mountain. Outfit your car with a small 4-inch decal or add a 10-inch decal to your home! Either way, the vinyl is durable and rated to last 5–6 years outdoors. 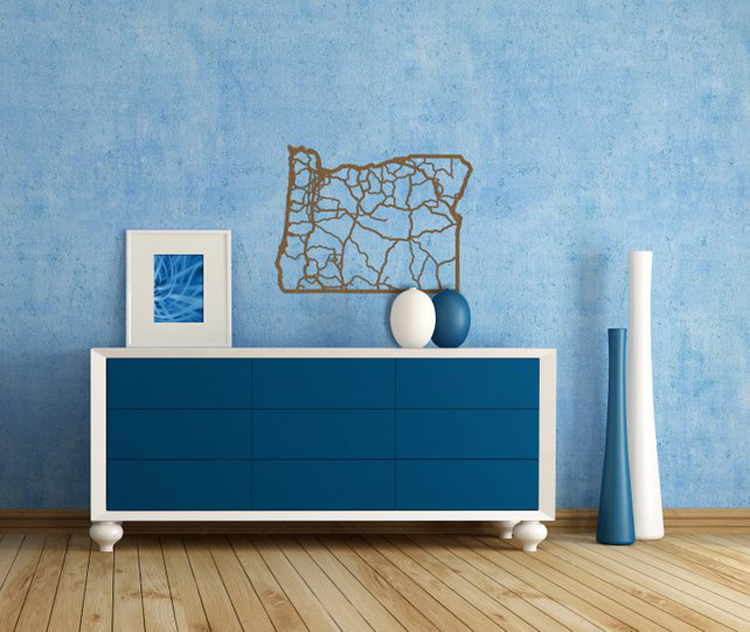 Show off your state pride with this oak state map of Oregon. The map is precision cut from ¼-inch A1 grade oak plywood using laser cutting technology. All maps are hand-stained with a dark walnut Danish oil and come ready to hang in your home! 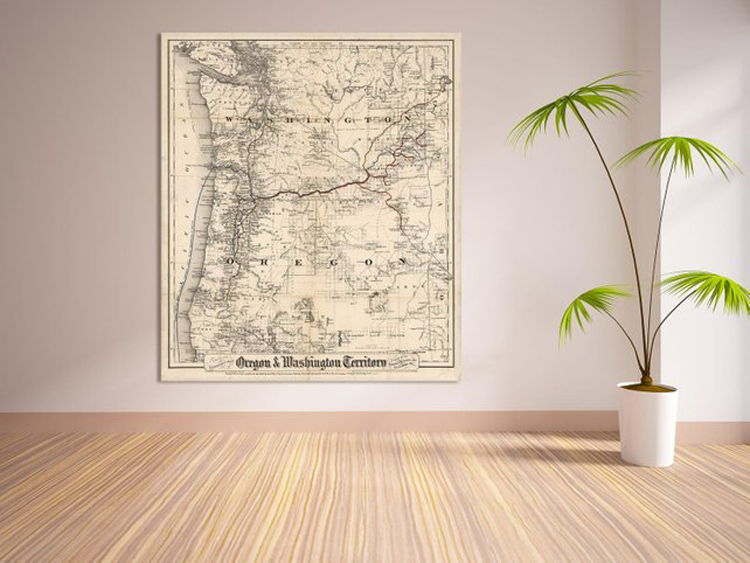 Photo Courtesy of Clavin Inc.
Add a vintage touch to your space with this antique Washington and Oregon map. You can personalize your order by specifying the primary color you prefer, including navy, black, original (tan) or gray. Plus, choose the dimensions and material, including photo paper, matte paper or a canvas. This former military family has lived in many different places and understands the importance of taking pride in your roots. Harbor and Home creates rustic and unique wooden signs, each of which is made to order with reclaimed wood, which ensures no two pieces are the same. Check out this series of whimsical, detailed picture maps taken from a rare school geography book published in 1931. 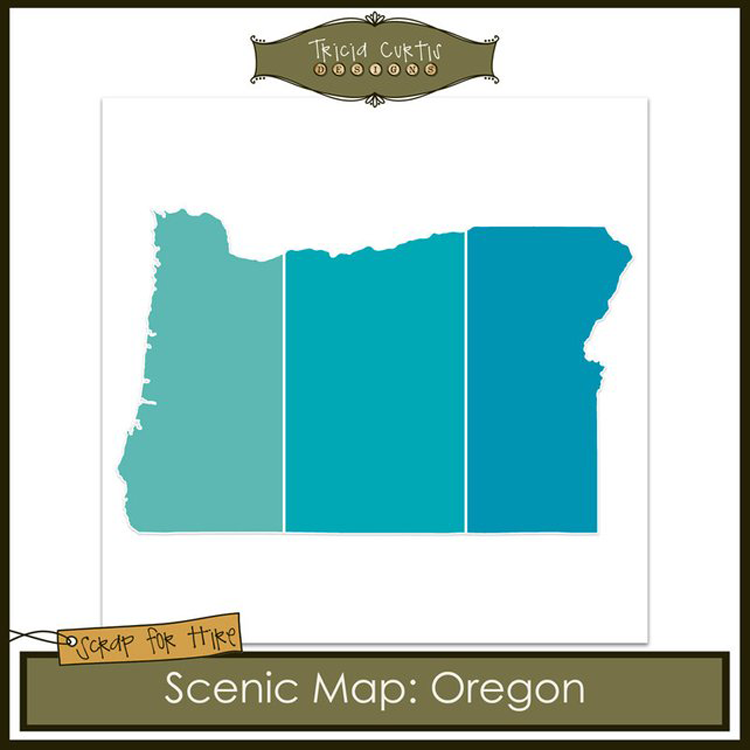 The illustrations include pictographs showing local activities, industries, topography and other elements of Oregon. Each map is professionally printed on premium acid-free/archival photographic paper that is rated to last over 100 years! 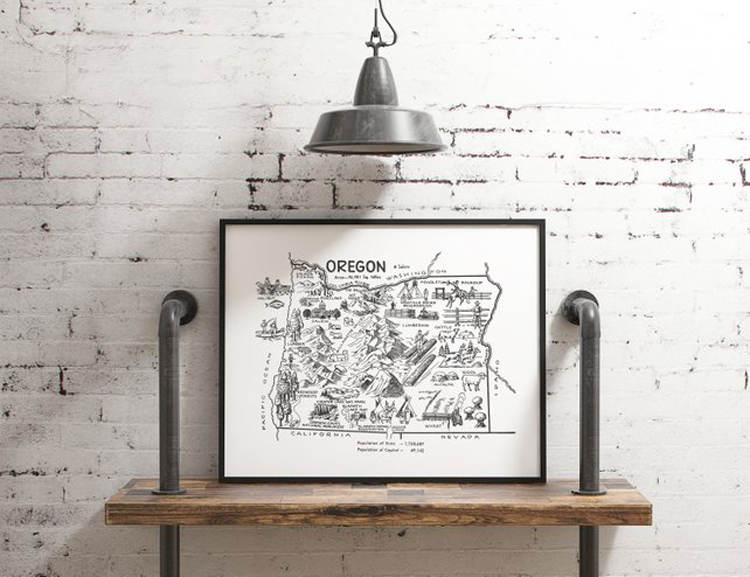 Choose from a variety of sizes and colors to personalize your vintage map of Oregon. 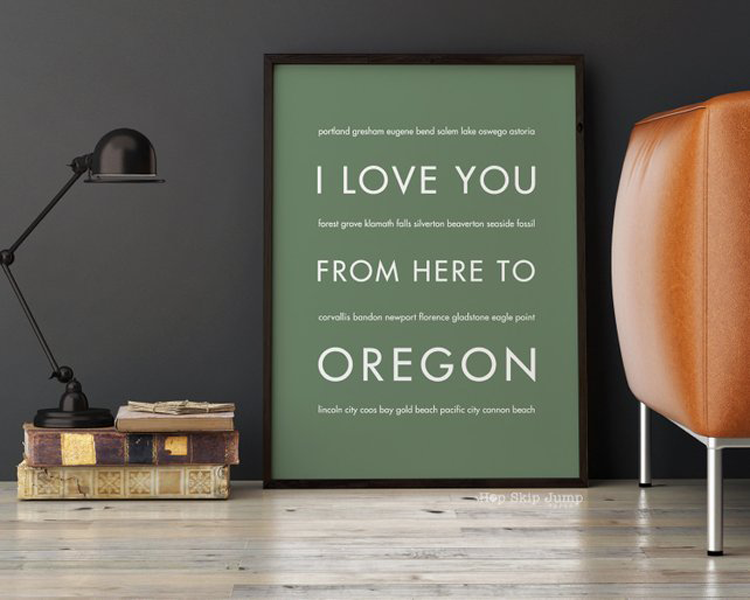 Express your love with this adorable print from Hop Skip Jump Paper that reads “I Love You From Here to Oregon” in addition to the major cities of Oregon lining the space in between. 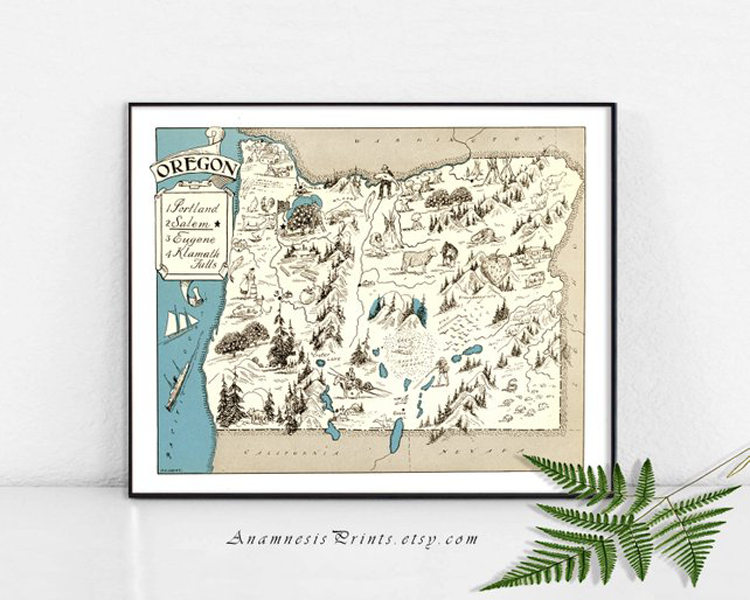 This makes a great gift for a fellow Oregonian! 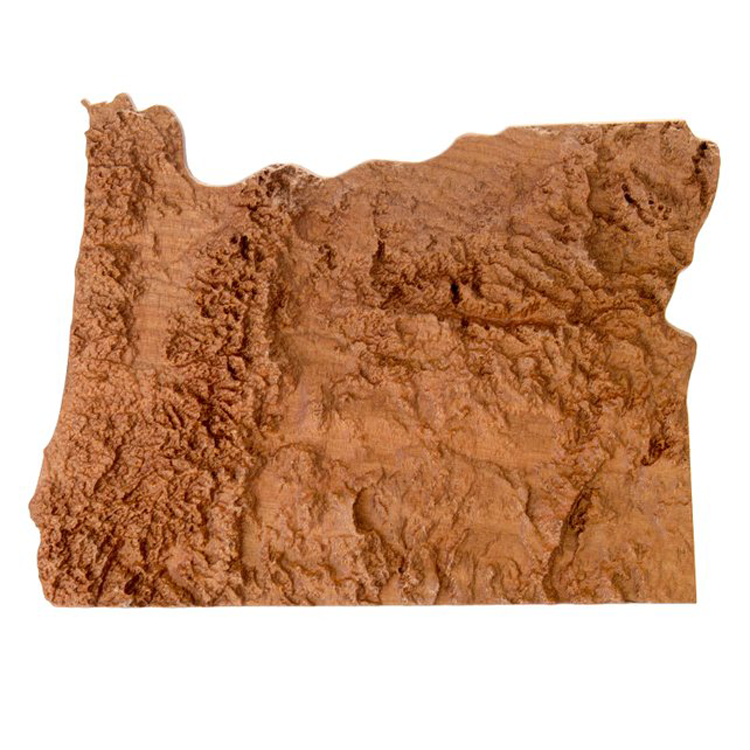 Bring the topography of Oregon to life with this 3D map, which shows an actual interpretation of the terrain and elevations of the state. From the highest point at Mount Hood (11,249 feet) down to sea level at the Pacific Ocean, this piece is a unique take on your typical topographic map. 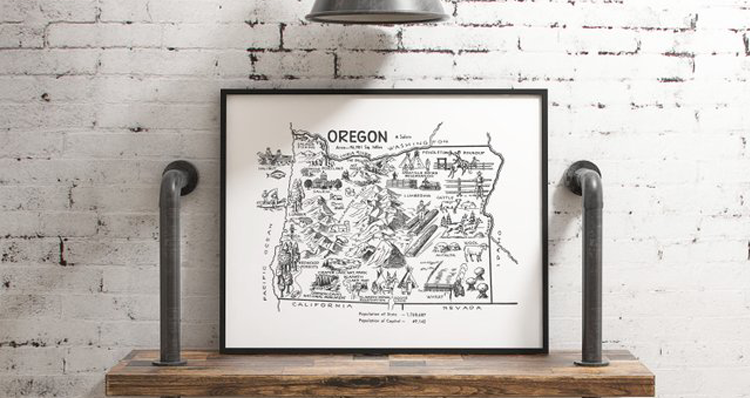 How adorable is this illustrated map print from Livi Lou Designs? It showcases a number of major attractions and features of the state, all of which are colorfully illustrated and labeled. For just $5, purchase the digital JPEG of the print so you can access it within seconds and have it printed for your home! This makes for a great addition to a kids’ room or nursery but could really go anywhere in the home to add a pop of color. 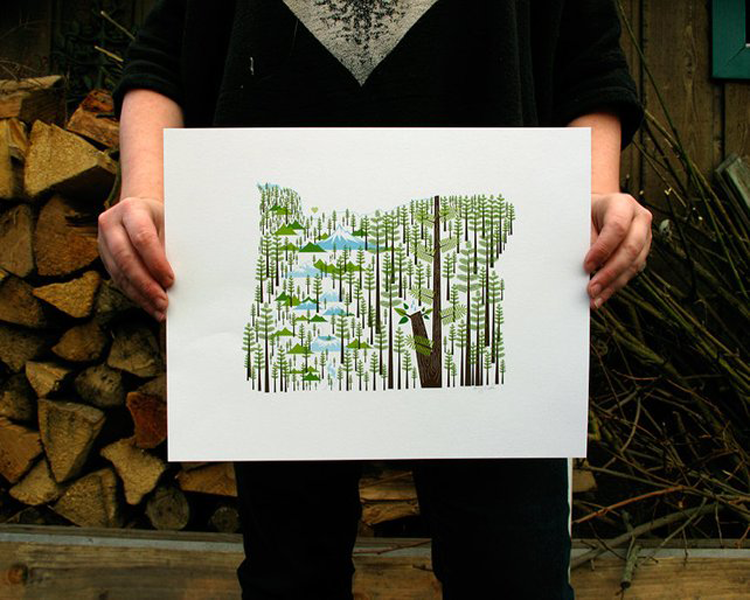 This minimalist watercolor print is a simple way to show your state pride. In fact, you can download the file and have it printed in a matter of seconds for hanging or gifting. It has a distressed and imperfect look and the plain black and white means it will go with any decor. 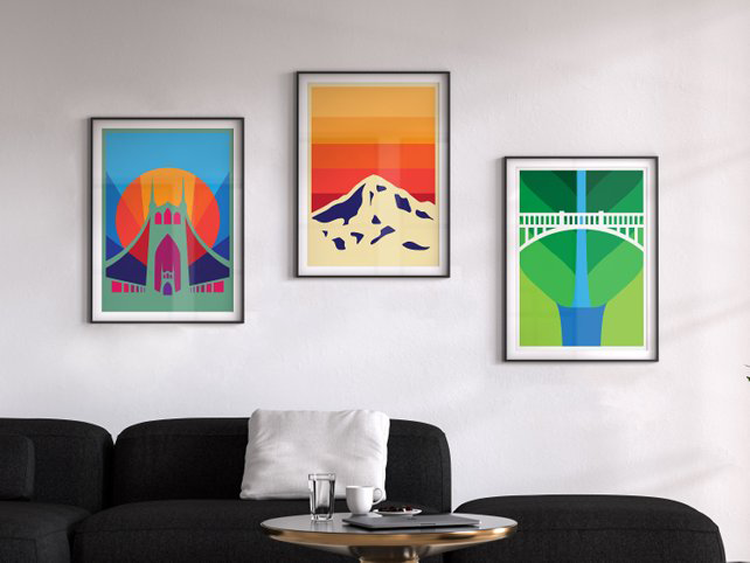 Photo Courtesy of Anthony Boyd Graphics via Rockwell Design Co.
We are loving this bright and modern collection of Oregon posters, displaying three of the state’s most distinct landmarks. Each poster was designed by hand and is printed on 11.5-by-16 enhanced matte paper. They can be grouped together or displayed separately! 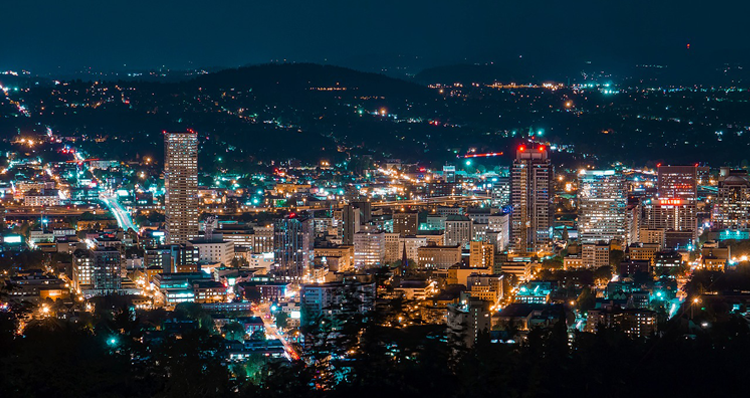 This wooden state outline features an abstract landscape of the Portland skyline. However, all products made by Sign Nature are completely customizable, and you can choose the color, size and even the image on the sign! This piece was laser cut into 5.5 mm-thick baltic birch, which has been sanded, stained, and finished by hand. 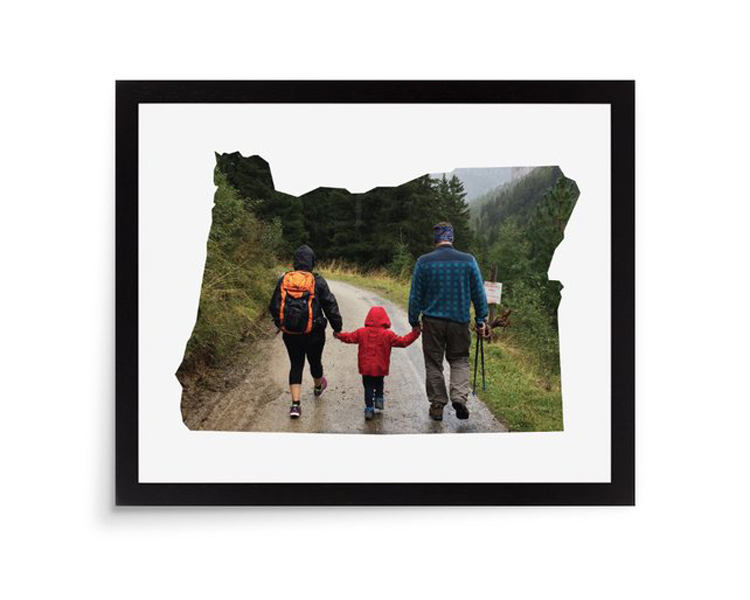 Display your favorite family photo in this unique state outline photo mat, ready to be slipped into the frame of your choice. The white cardstock mat is 10-by-8 and the opening measurement (how much of the photo is shown) is approximately 8-by-5.8 inches. Elk are commonly seen traversing the terrain of the Pacific Northwest. 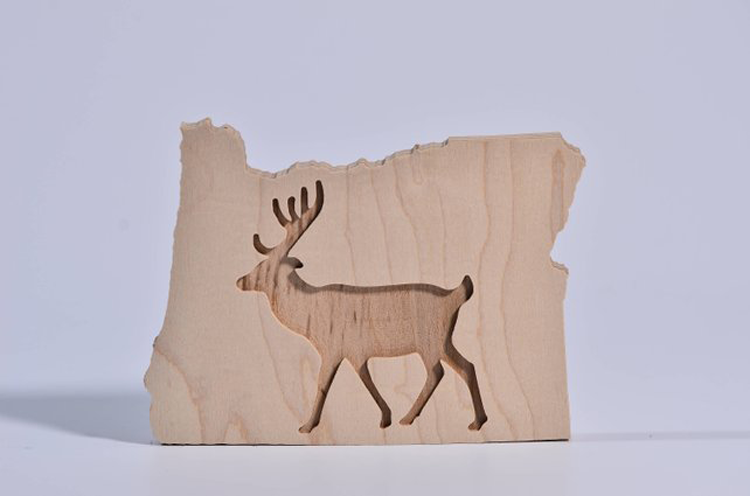 This beautiful wood piece was created by a native Oregonian living in Portland who enjoys creating rustic projects out of recycled and reclaimed wood. This immaculately cut wooden state design with an elk outline was etched on 7-ply half-inch birch with an applewood veneer. The piece can stand on its own or be added to a bookshelf or mantel! This intricate map image was taken from a coloring book published in the 1950s. It has been carefully scanned and digitally altered, resulting in a whimsical black and white image, which can be framed as wall decor! Look close to see the professional artwork showcasing some of the state’s most iconic landmarks, industries and attractions. 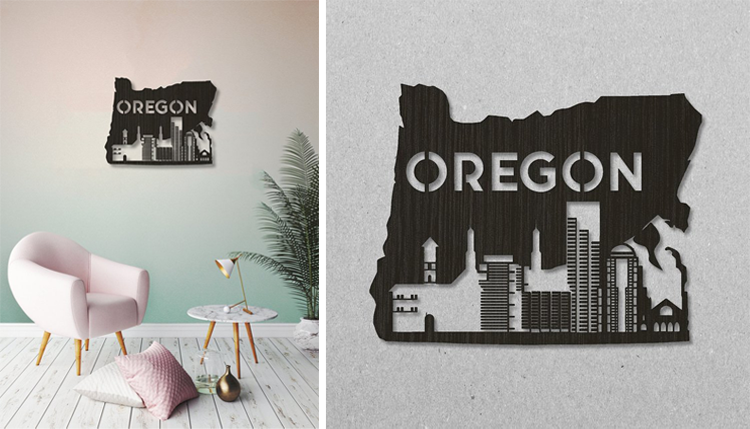 Create your own photo collage in the shape of Oregon’s outline with this downloadable file. The template can be manipulated on Photoshop or Paint Shop Pro to include three of your photos displayed side by side. The original size is 20-by-20 but can be scaled down to print whatever size you desire! 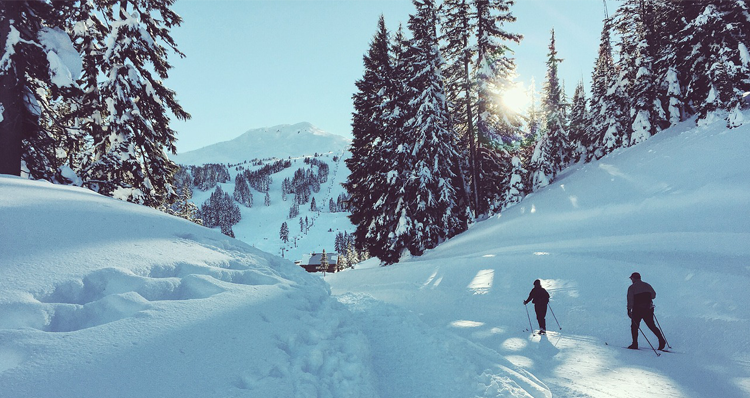 Honor the undeniably breathtaking natural beauty of our state with this digital nature print, which includes landmarks like Crater Lake, the mighty Columbia River, Mount Hood, lots of trees and even a heart above Portland. Portlanders, you can skip the shipping fee if you would prefer to pick up your print from the artist’s home studio in Southeast Portland! Which piece catches your eye?